Kale is a cabbage that never forms a head. Each serving of kale contains many times the daily dose of Vitamin K. Vitamin K is used by the body to coagulate blood, strengthen bones, and reduce calcification of the arteries. Kale also contains a lot of Vitamins C, B6, folate, and manganese, and many other important nutrients. If you enjoy eating kale, your body will thank you. Kale can grow in a wide range of environments. It can also get by in partial shade, making it a good choice for shade gardens. 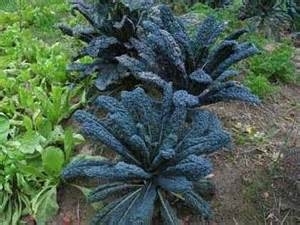 In the Bay Area, kale can be planted in September and October, and then again in January, February, and March. While direct seeding is the way to grow kale in colder climates, our scorching hot summers and autumns make starting seeds in small pots a better idea. Seeds should be planted 1/2 inch deep and the soil kept moist until germination occurs. You can reduce the amount of water needed (and time invested) by covering pots with a 1/4 inch layer of vermiculite. Vermiculite reduces evaporation and can hold many times its weight in water, but tiny seedlings can easily push their way through. As your seedlings are growing, use that time to prepare planting beds. Kale prefers loose, loamy soil, so incorporating aged compost will improve the flavor of your kale. Two months before the first frost date, seedlings can be transplanted into their garden locations. When transplanting kale, bury the plants up to the first set of leaves. This encourages a stronger root system. Be sure to mulch around each plant to conserve moisture, reduce competition from weeds, and provide a nutrient boost. You can also side dress plants halfway through their growing season for the best production. Side dressing simply means placing aged compost around the base of each plant. Watering and critters will get the nutrients down into the soil, where the plants can use it, without the disturbance and damage caused by digging. As with all growing things in the Bay Area, aphids, cutworms, nematodes, leaf miners, leaf rollers, whiteflies, and wireworms are common pests. Random, round holes in kale leaves are a sure sign of imported cabbageworm infestation. Damage seen on the underside of leaves indicates cabbage loopers. Flea beetles, cabbage maggots, and darkling beetles may also enjoy feeding on your kale plants. Row covers can protect your plants from many of these pests. Powdery mildew, downy mildews, clubroot, black rot, bacterial blight, alternaria leafspot, fusarium yellows, phytophthora root rot, verticillium wilt, and white rust are the most common Bay Area kale diseases. Most of these diseases can be avoided with proper irrigation, good drainage, and regular crop rotation practices. Your kale plants can produce edible leaves for many months if you harvest leaves from the outside first. The plants will continue to produce new leaves from the center, creating an ongoing harvest. Because kale grows so well in our winter climate, the plants make lovely landscape additions into areas that would otherwise be able through the winter. Kale has a strong flavor, but it packs a powerful nutritional punch and is easy to grow in California winters. Give kale a try. You may find that the fresh, tender new leaves are just what your body has been craving!